If you’re determined to keep costs to a minimum, the Chase Ink Business Cash Credit Card offers a lot of cash back on your business purchases — including purchases made on employee cards — for no annual fee. The Chase Ink Business Cash card is hard to beat if your primary business expenses involve the internet, cable, telecom and office supply store purchases. Ink Business Cash offers a $500 sign-up bonus, which is exceptionally high for a no-fee business card. It also rewards regional business expenses, such as driving to meet clients or taking them out for meals. Any charges that don’t fall into those categories, however, earn a flat 1 percent cash back rate. As with all tiered rewards cards, it’s important to see if the card’s bonus categories fit your spending patterns – you may find that a flat-rate card or a card that offers bonuses in different spending categories gives you a higher average rate of cash back. You get 5 percent cash back on internet, cable and phone services and at office supply stores on up to $25,000 in purchases per year. Since Chase stopped offering access to its Ink Plus card, Ink Business Cash is the only no- or low-fee business card from Chase to offer 5 percent back on these categories. You can charge many of your monthly services, such as internet, cable and cell phone expenses to the Ink Business Cash card, as well as expenses for websites or streaming services, to earn an ongoing high rate of cash back. Ink Business Cash also earns 2 percent cash back at gas stations and restaurants. That’s a solid return if you do a lot of driving and dining out related to your business. An additional perk for frequent drivers: Chase provides insurance for car rentals charged on the card — the same policy that it offers to its Chase Ink Business Preferred cardholders for a $95 cardholder fee. 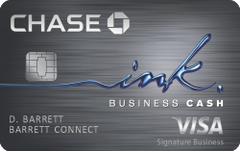 Chase is currently offering an elevated offer for the Ink Business Cash card of $500 after spending $3,000 in the first three months of account opening — or 50,000 Ultimate Reward points if you have an Ultimate Rewards card, such as the Chase Sapphire Preferred Card, that allows you to transfer points between cards. This is an unusually rich bonus for a card that charges no annual fee. It’s a great time to sign up for the card if you want to collect a large number of Ultimate Rewards points. Ink Business Cash is pretty flexible in letting you redeem your cash back. There’s a small 2,000-point threshold that you must meet to redeem your rewards and a $25,000 annual purchase limit on your bonus earnings. Otherwise, it’s pretty easy to use your rewards. You have many redemption options besides cash back, including transferring points to certain other Chase credit cards that earn Ultimate Rewards points. The option to transfer points makes the Ink Business Cash card – and Ultimate Rewards cards in general – especially valuable. You can pair the Ink Business Cash card with other Ultimate Rewards cards and use its 5 percent bonus on business purchases to maximize your points. For a no-fee business card, Ink Business Cash packs some nice perks. It allows you to set individual limits on employee cards. Plus, you and all card-carrying employees get the full menu of Visa Signature Benefits, including travel insurance, auto rental insurance (theft and collision), up to 120 days of purchase protection and extended warranty protection that includes an additional year on U.S. manufactured goods. This card does not reward travel that involves more than a day trip in your own car. Hotel, airfare, rental car or train fare earn the default 1 percent rate – which is not a good return on such a significant expense. If you are a frequent traveler searching for a very rewarding business rewards card, you should check out the Ink Business Preferred card – it offers a very generous sign-up bonus, three points per dollar on travel purchases and a 25-percent bonus when you redeem your points for travel. Why get the Ink Business Cash card? You want to avoid annual fees on your own and/or employees’ business cards. You have at least $3,000 in business expenses coming up in the next three months to score the sign-up bonus. You want to start with a low-cost business card that will earn big rewards on purchases from office supply stores. Your business incurs significant ongoing spending on internet, cable and telecom services. You have a local business that involves lots of driving and dining. Use your card for most purchases for the first three months so you can hit the $3,000 minimum required to earn the bonus. If your startup costs involve equipment that can be purchased at office supply stores such as Staples or Office Depot, this card may prove a low-cost way to cash in on front-end expenses. Using Ink Business Cash for those purchases also means you’re covered under Ink’s purchase protection plan. Put all internet, cable and telecom bills on autopay to the card to ensure you get 5 percent back on those expenses. If you plan to do any long-distance travel, consider pairing this card with the Chase Sapphire Reserve, which earns triple points on travel purchases.